Welcome to the new era. Welcome to Rogers Place. The official opening of Rogers Place, put on by the City of Edmonton and Oilers Entertainment Group Thursday evening, had a unique, almost foreign feel to it. The numerous, and quite sizeable, LED screens displayed vibrant colours and patterns. The opening music was supplied by a DJ, who was perched by a modern stage and podium in the heart of Ford Hall. The evening began feeling like the opening of a trendy Los Angeles art gallery. 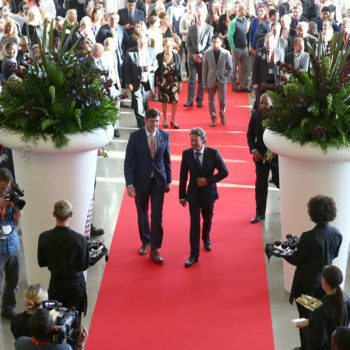 The arena itself is a work of art, and that impression was punctuated by the suits and dresses that floated about the stylish entryway to the City’s new arena. It’s a new age for sports and entertainment in Edmonton. At first glance, even just this small portion of Rogers Place starkly contrasts what the City is familiar with when it comes to entertainment. The vast open space of Ford Hall, the natural lighting and modern curvature of the architecture is a distinctly unique sight and the official opening was unique in itself. 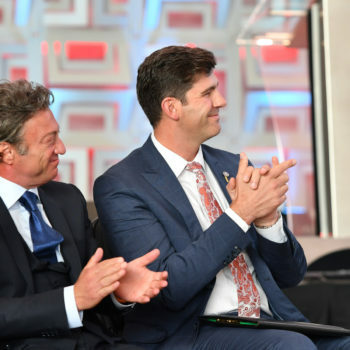 “For the first time in decades, Edmonton will have a world-class urban core to match its world-class community spirit,” said Daryl Katz, Chairman of the Katz Group of Companies. 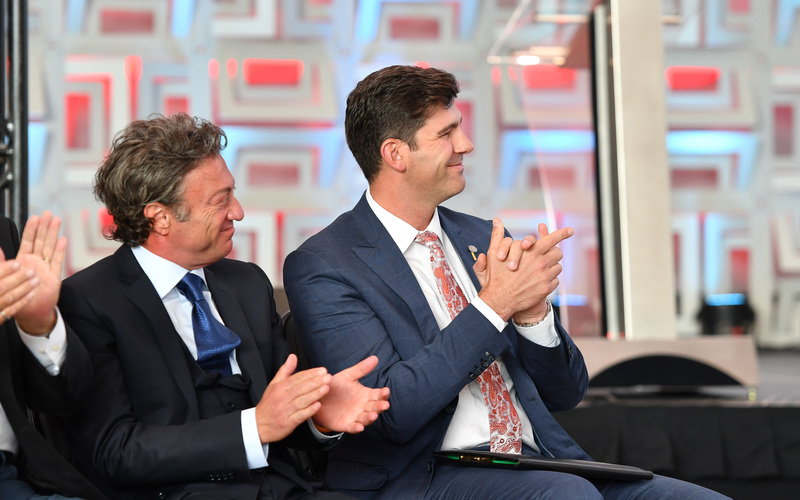 Beginning eight years ago, Daryl Katz’s groundbreaking vision for a new downtown arena has finally become a reality. 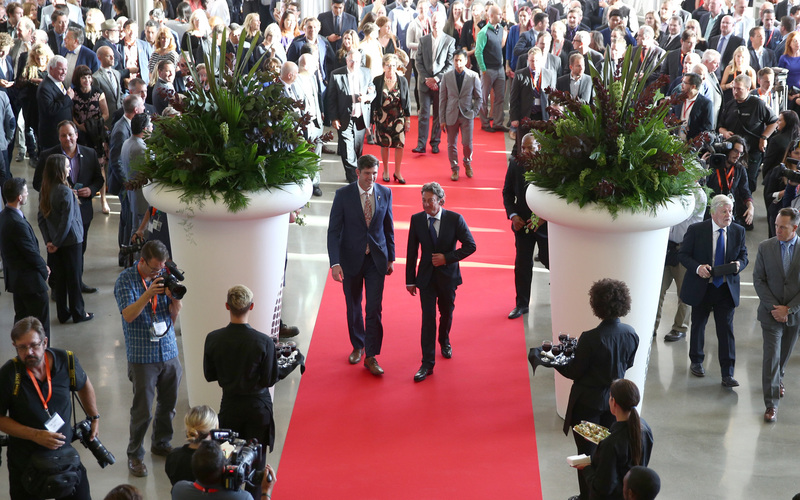 Today, the official opening of Rogers Place, marked the beginning of a new journey. Acting as a centerpiece for the revitalization of downtown Edmonton, Rogers Place breathes new energy into the downtown core. “It was eight years ago that a leadership committee, drawn from across the community, wrote in its city-shaping report, ‘The greatest opportunity for Edmonton lies in developing a new facility that will revitalize our downtown and add to the excitement that is just getting started to build in our core,’” said Katz. Daryl Katz stands with Mayor Don Iveson for the official opening of Rogers Place. 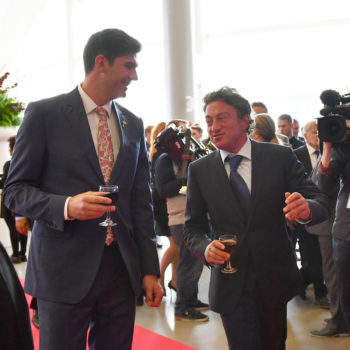 His Worship Mayor Don Iveson also shared words of excitement and gratitude towards the many key players involved in the planning, construction and operation of Rogers Place. “This is Edmonton’s spirit in action — our community coming together to build a dream into a reality,” the Mayor said. 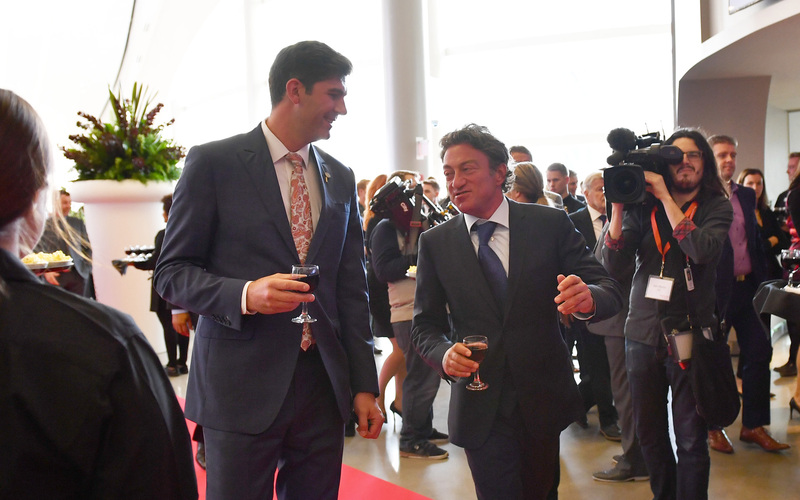 The Mayor joined Daryl Katz at the gated entrance into the arena from Ford Hall, where together they christened the entrance with the pull of a rope, followed by dazzling pyrotechnics and streamers to celebrate the official opening of the new epicenter of entertainment. One of the first guests to walk through the gates — The Great One himself. “The atmosphere and the building is exactly what Edmonton is all about. 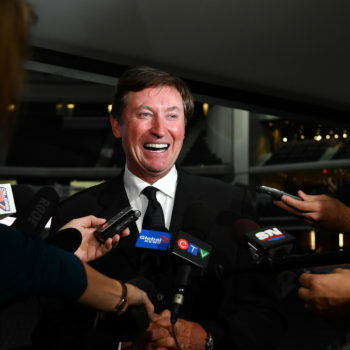 It’s friendly, it’s classy, it’s nice, it’s warm, and I truly believe Edmontonians are going to brag about the whole entire complex for eternity,” Wayne Gretzky said. 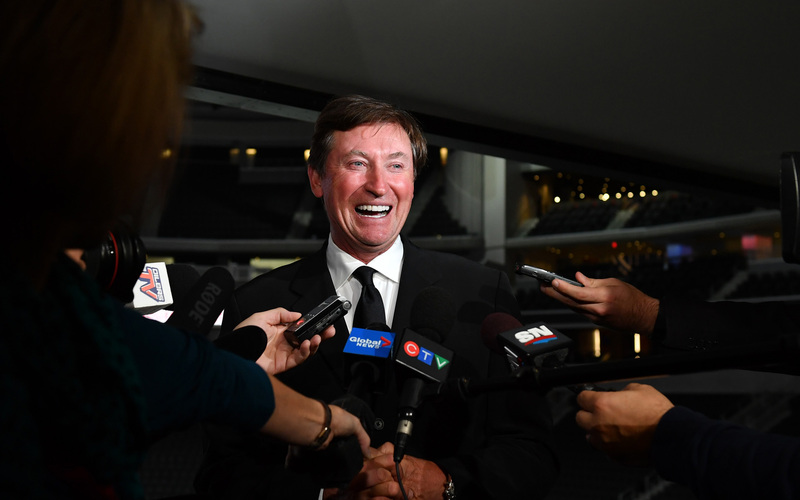 But all jokes aside, Gretzky expressed his great admiration for the new arena. Iron Foot Place inside Ford Hall. Unbeknownst to him, memories were already being made inside Rogers Place. 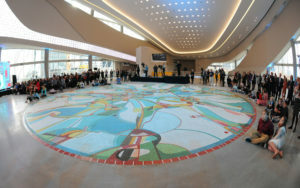 Earlier in the day, Rogers Place welcomed Alex Janvier — the signature artist for Ford Hall — alongside family, friends, and members of the media, for the official unveiling of Iron Foot Place. This weekend, Rogers Place will officially open its doors to the public for the Open House, where it is anticipated over 56,000 fans will walk the expansive concourses and explore the many levels, taking in the astounding sights and sounds that make Rogers Place so unique. Unlike any other grand opening for venues, the official opening of Rogers Place — complete with drum circles and traditional dances — set the tone for the extraordinary experiences still to come inside the new arena. In the heart of downtown, Rogers Place will soon be known as the epicentre of “wow”.